For my first year milestone of blogging, I thought I’d talk about my favourite subject, gaming! My first post was a look at my video game origins, which you can check out here, and I thought it would be fitting to try to continue on with how my gaming tastes have shaped into the present with what I have narrowed down to my top three favourites over the years. This must be one of the most well known game series that exists. I started with Oblivion back in 2008, a couple of years after its release, and it really came as a delightful shock. Having the freedom to ride, run, jump and swim to explore a world as huge as Cyrodiil was amazing, and I think it must have been the first single-player open-world RPG I’d played. I was overwhelmed by the sheer size of the map and number of quests and the Imperial City still remains one of my favourite locations ever. As shown by the disappointing Elder Scrolls Online game, single-player experiences can be much more personal and enjoyable which MMOs can often fail to deliver. Naturally I was very excited to hear about the next instalment, Skyrim, which would have improved graphics and, more importantly, dragons replacing the rather irritating oblivion gates. I got it for Christmas 2011, a month after its release, and it has since become one of my most played games. I’ve already written a post on my love of discovery in Skyrim here. Overall, the Elder Scrolls series is absolutely one I highly recommend. I still need to check out Morrowind as that’s meant to have the best story of the three but Oblivion and Skyrim gave me plenty to enjoy! 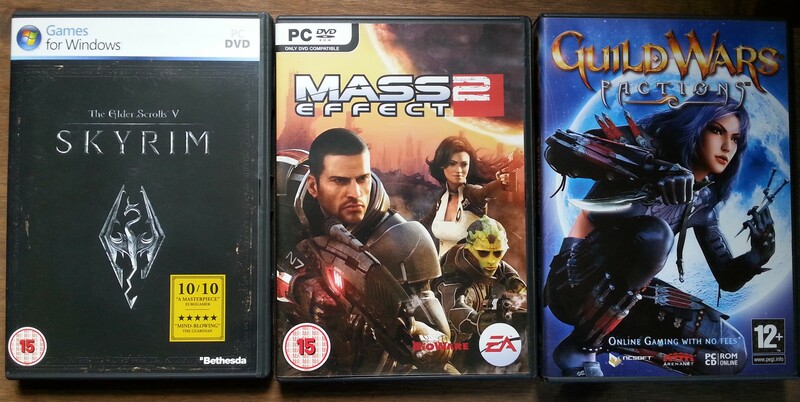 Don’t judge me but Mass Effect 2 is the only game of the trilogy I’ve had the pleasure to play. It seems futile but I’m still holding out for a big DLC sale for the trilogy before buying the other two as it apparently massively improves the third game. What I can say is that I bought into the overwhelmingly positive reviews for this masterpiece on its launch, and despite me, once again, having little experience of this action-RPG genre, it’s another game that shoots straight into my top 3. A bit of a strange comparison but it just reminds me of the slickness of a Nolan film, and it really could be adapted with its story one of the most thrilling and engaging I’ve ever played. Making choices that have meaningful actions, choosing whether to be a paragon or a renegade, deciding what class and combat style you want, it all meant there is so much replay value and I think I’ve got another playthrough coming soon! Finally Guild Wars. I couldn’t leave this out! If you’ve been following my blog then you might be aware of the affection I have towards the original trilogy. No MMO has ever managed to match it, not even the sequel in my opinion. I started playing it in 2006, coinciding with the release of the second campaign, Factions, and I’d say it was Cantha that helped create such a good impression. I wrote a review a while ago on the series which you can check out here. There are a few aspects to Guild Wars that particuarly stood out, firstly the low level cap meant there was little emphasis on grinding – the age-old problem associated with MMOs – and the music. Hopefully you’re familiar with Jeremy Soule, but if not then he was the man behind the Elder Scrolls soundtracks, as well as Guild Wars, I mean that can’t be a coincidence right?! Just listen to the music in the trailer! It’s unfortunate that everyone has moved on from it, such was inevitable with the newer GW2, but I’ll forever remember it as one of my favourite games. I hope you’ve enjoyed reading this, and I can’t thank you enough for following my blog over the past year. I should be posting more frequently over the summer. Let me know what your favourite games are! This entry was posted in Gaming, Opinion, Updates and tagged 2015, best, Elder Scrolls, favourite, games, Gaming, Guild Wars, mass effect, oblivion, Skyrim, top 3, Update, Video Games. Bookmark the permalink.